On September 8, 1949, two navy F8F Grumman Bearcat aircraft took off from the Quonset Point Naval Air station for what was to be a high altitude instrument training flight. One of the aircraft, (Bu. No. 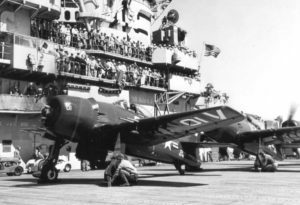 95332), was piloted by Ensign Henry J. Harling, 22, of Staten Island, N.Y. While at 10,000 feet both pilots went on oxygen and continued to climb to 32,000 feet. At 28,000 feet Ensign Harling reported smoke in his cockpit, and both aircraft began to descend. A short time later, while at an altitude of 25,000 feet, Harling radioed to the other pilot that he was going to bail out. The other pilot later told investigators that he saw smoke coming from the area of the exhaust ports, and that the tail wheel on Ensign Harling’s aircraft was down. He observed Ensign Harling open the cockpit canopy, and at that time saw that he was still wearing his oxygen mask. Harling’s plane was then seen to roll on its back, nose down, and spin twice, before apparently recovering. It then entered a cloud bank and the other pilot lost sight of it. The other pilot followed Harling’s plane down through the cloud bank, and upon coming through it observed an explosion when Harling’s plane hit the water about five miles off Sakonnet Point. Witnesses on boats reported seeing Harling’s plane trailing smoke before it hit the water. No parachute was observed. Planes and rescue boats were immediately launched. An oil slick was discovered, but after a two-day search it was concluded that Ensign Harling had been unable to escape from the cockpit and had remained in his aircraft when it hit the water. The cause of the accident was speculated to be a failure in the aircraft’s hydraulic system, particularly with the aircraft’s tail wheel. Ensign harling has been assigned to VF-73.